After "New Girl" made him a TV favorite, Jake Johnson's fans have grilled him about his character's love life. 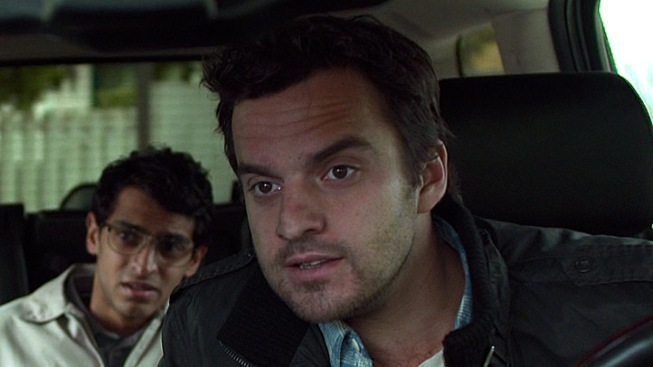 If you spot “New Girl” star Jake Johnson at the grocery store or in an art museum, he’ll know you know who he is, so just ask what you want to ask already. He’ll be patient. Johnson’s profile certainly popped since he began playing Nick Miller on the FOX sitcom last fall, combined with scene-stealing bits in films like “21 Jump Street,” “No Strings Attached” and “A Very Harold & Kumar 3D Christmas.” And as he takes on a surprisingly dramatic role in the intriguing indie “Safety Not Guaranteed,” Johnson tells PopcornBiz he’s come to expect funny fan encounters after that first year of fame. From the time you were making this movie to now how radically different is your life? A hundred and eighty degrees, absolutely – It's been a crazy year, yeah. Since it started, I shot the ‘New Girl’ pilot, and then I forgot about the pilot because I viewed the pilot as an eight-day independent movie, that we were making a long short. Then I was in Seattle for "Safety Not Guaranteed" – I knew I was going to do '21 Jump Street' after, and so I thought, 'Well, I have my summer planned. I'll go home for a while, relax a little bit and figure out the fall and or winter.' My wife came and visited me. We were at the hotel, relaxing, and I actually checked 'Deadline Hollywood.' I got on and it said, '”New Girl" has been picked up to series.' I didn't get the call from the agents or anything, and I thought, '"New Girl" has been picked up to series? Weird.' Then I got a call and everyone called, and they said, 'You're going to Up Fronts in two weeks. That was the beginning of my life being different. Mark Duplass stars as a man who places an ad looking for a time-travel companion, and Aubrey Plaza ("Parks & Recreation") is the young journalist who goes undercover to answer it. Did you have to really wrap your head around, first, the commitment of a series and then just everything that was happening, that strangers were now looking at you twice in the grocery store? Yeah, that's exactly what it is: It's the look-twice. Actually, people who recognize people are pretty cool. I'm very fortunate, and I'm obviously not the celebrity that the big stars are, and so people who recognize me aren't freaking out and weird. But what happens is that the world gets very small and paranoia sets in because you're in a Walgreens and all of a sudden it feels like there's a 16-year-old girl following you, but whenever you turn she's looking away. So, you go, 'Is this kid following me, or am I being weird?' Then all of a sudden you hear, 'Excuse me, are you Nick Miller?' You go, 'Yes, I am Nick Miller.' Then every once in a while you'll be walking and someone in a pack of four people will go, [whisper-shouts] 'Nick!' I'm like, 'Well, that's not my name, so I'm not going to turn.' [Whisper-shouts] 'Nick from "New Girl!"' Then you go, 'Hey, guys, you're right. Hi.' That gets weird. How does your wife deal with 16-year-olds following you around? My wife Anne is an artist, and we went to the Art Institute in Chicago and it was really fun and she's explaining all the art to me. I'm kind of a brick-head with it, and so I was really trying to pay attention. We kept hearing giggling, and, I mean, you're in a museum. It's pretty silent. We were in these cool back rooms and whenever I turned around there were these three young girls. I'd look over and they'd go, 'Very good art...' I was like, 'They're so full of s**t, man.' So I was talking to Anne because it was kind of her day and I was like, ‘What do you want to do?' She goes, 'Just approach those girls and say, "Are you guys fan of the show?"' So I walked up and I said, 'Are you guys fans of the show?' And they freak out and then I was like, 'Is there anything you'd like to ask?' They had probably six to 10 rapid-fire questions, just fanned out, like, 'Are Nick and Jessica going to get together?' 'I'm not sure.' 'Does Nick love her?' 'I think probably deep down.' 'Does he love her because she's funny or because she's good for him?' 'I'm not really sure about that one.' 'Does Nick really like his friends?' 'Yeah, he does.' 'Who does he like the best?' 'He likes them all the same.' 'Do they ever fight?' 'Yeah, every once in a while they annoy each other.' 'Does Nick like living with everybody?' 'He does.' 'Nick's funny.' 'Thanks.' Then we finish and I said, 'Is there anything else?' We did the photos and then they had a moment where they were like, 'That's it.' And so I went back to my wife and we had a talk – like, it is just a slight adjustment, but it's not bad. It's just that the show has been a slight adjustment with kind of everything. 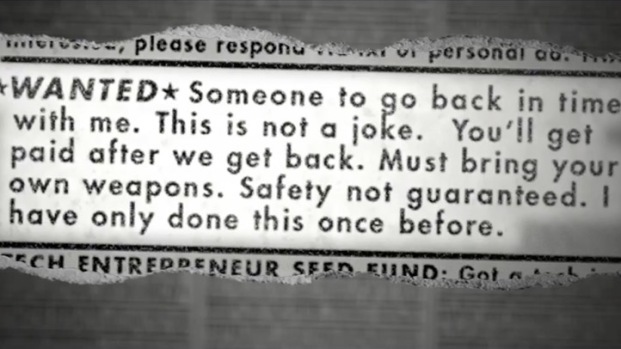 Are you excited that “Safety Not Guaranteed” is coming out now and that people know you from the show will see you doing something different, more bittersweet? Absolutely. What I really hope is that people who like 'New Girl' come and see this movie because I don't quite know how these little movies can break out, just as a business model in 2012 in our industry. I love these little movies, and I really hope that these little movies don't fade away. I hope that they don't become a thing where the business makes 'Avengers' and big shows, and then little movies, who cares about them? The only way for that to actually exist and for these little movies to be taken seriously is if they make money and is if there's a business model for them. I feel like less and less of these movies make money, and more and more of them are like Video-on-Demand. They make their money back through cable sales and international sales. So everyone is happy, but they don't do anything to keep the business excited about them. I think it's a shame. I think if these movies don't find ways to break through we're going to lose a lot in terms of acting and writing and directing and story and new faces breaking out and getting opportunities. I hope that everyone who likes 'New Girl' sees this and everyone who likes 'Parks and Rec' and 'The League.' I hope that people check this movie out. How has the evolution of the show been through the first season – finding those relationships, where you can go with them once they get entrenched? I think when I started the show Nick was one thing. That was grounded and kind of grumpy, just annoyed by everybody. I think through the evolution of it, you can't do, in TV, one thing like that. It just changes, and so all of a sudden you then have to say 'Well, what else can these characters do?' Max [Greenfield] and I do bits on set all the time, and so all of a sudden I'll read a script and now Schmidt and Nick are pitching real apps to Russell, Dermot Mulroney's character. Well, before, Schmidt would've pitched it and Nick would've said, 'No, it's a stupid idea. Stop.' But as it goes, you go, 'Well, just throw him in there with him,' and the evolution, as it becomes more of an ensemble, everyone gets to have fun. That's been a nice realization about it. Given that the show has at least another season of “New Girl,” what do you want to do with your career with the free time that you have? I want to just do interesting stuff. The idea of celebrity doesn't mean very much to me. The idea of getting bigger and bigger, it's not as cool as I thought that it was when I was 12…I don't understand this new era of people wanting to be celebrities for the sake of celebrity and reality stars. I think that is the least interesting part of the business that I'm in, but what I'd love to be able to do is continue to get opportunities to do interesting projects and play characters who are on either side of the fence of likable or not likable, or good or bad and try to find some truth to them where I, as a man, can say, 'This guy is a murderer,' or this guy is a blank, but I can see it through his eyes for this four and a half weeks in wherever we shoot it. Who are the role models for you, professionally? Bill Murray. Sam Rockwell. Mark Ruffalo. Back in the day the Jack Nicholsons and the Al Pacinos and those awesome guys. People who just push it. I think the actors who kind of do everything, but I really love Sam Rockwell's career. I think he's done a career in such a cool way, where he does these little movies that are great character studies, and then he's in some big movie like 'Cowboys and Aliens.' So those are the guys that I kind of look up to. One last question. Are Nick and Jess going to get together?